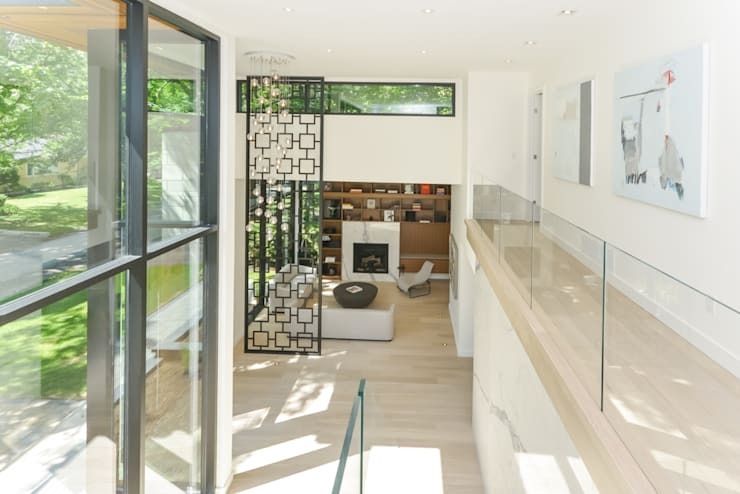 Ottawa-based architects and designers from Flynn Architect are the protagonists of today's feature, which will take you on a virtual tour a modern family home designed with a sense of spaciousness and movement in mind. High ceilings make this modern structure a lofty place to live, and streamlined, contemporary furniture add to a stately atmosphere. However, you'll find that these architects have been able to balance a authoritarian aesthetic with a distinctly artistic and funky vibe, manifested in the colourful abstract works sprinkled throughout the home. This modern glass facade is characterized by a friendly nature, with tall windows looking out over the front yard to greet passersby on the neighborhood street. 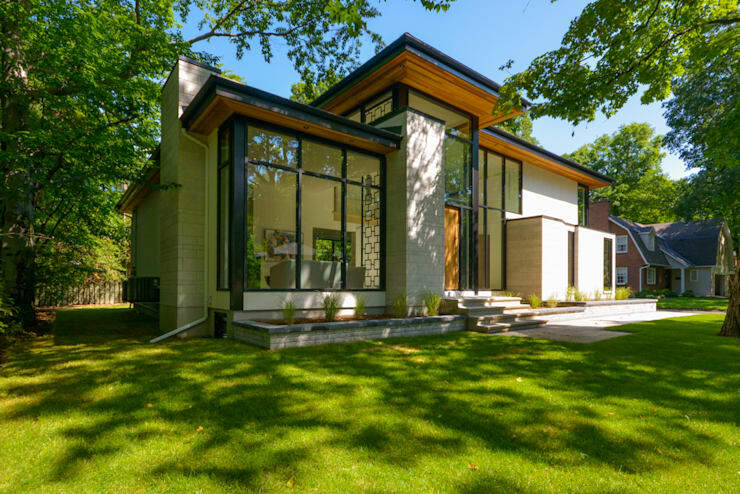 Mature trees occupying the lot provide shelter, allowing the architects to place an open design in a setting with frequent foot traffic – the natural shade and protection provided by these trees gives the home a sheltered and grounded feel. 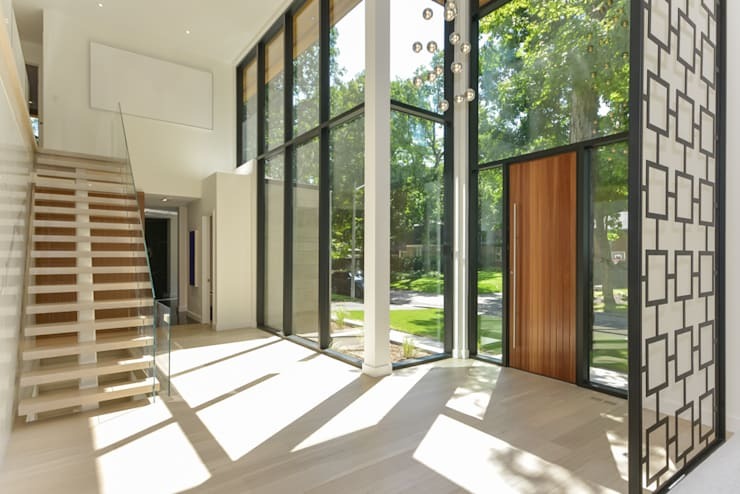 In a moment of pause, this front entrance leads into a spacious, high-ceilinged foyer that provides plenty of space for a smooth transition between public and private life. Attention is drawn upwards by the addition of an artistic chandelier resembling tiny floating orbs; your gaze might also begin to wander up the lightweight floating staircase. A view from the top of the stairs show the many layers and levels that intermingle to create a visually enriching entrance scene: a metal trellis visually separates the foyer from the living room, while glass railings add an invisible layer between the airspace in the foyer and the upper floor hallways. 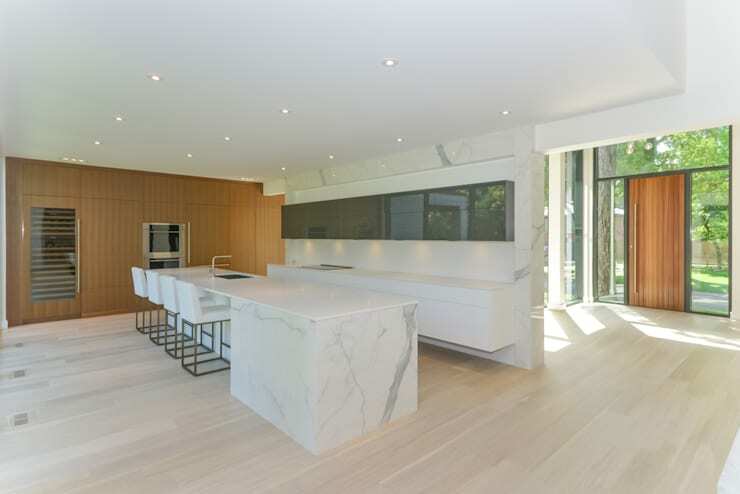 Just beyond the foyer, you encounter a highly unique kitchen characterized by solid mass, elongated shapes, and smooth surfaces (watch for similar aesthetic themes found throughout the rest of the home's interiors). A heavy stone slab places a central anchor in the room, while the rest of the elements are restrained, made to appear as smooth and seamless as possible. The fridge disappears into a paneled wall on the far end of the room, as do the ovens, and the kitchen pantry items hide behind the glossy doors of a long horizontal array of cabinets. While the kitchen takes on a utilitarian and reserved feeling, the dining room has a chance to let its hair down a bit. 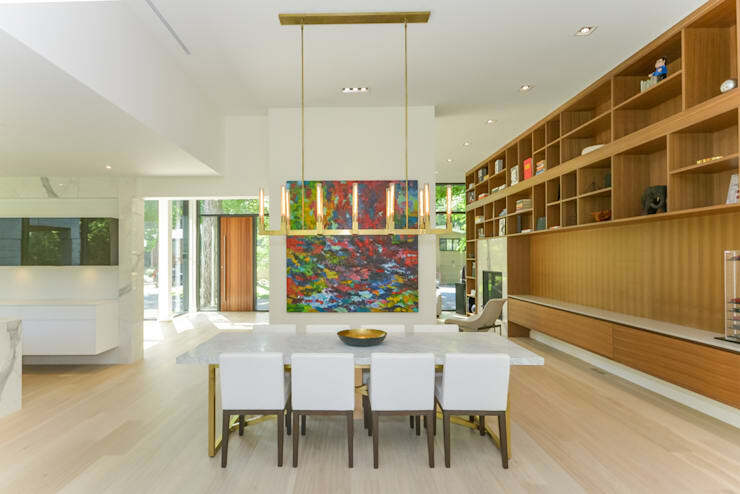 A colourful abstract painting brings a welcome splash of life into the room, and a unique candelabra casts a friendly glow over the dining room table. Once again, you find a room characterized by long shapes and solid surfaces, with an extensive wooden shelving unit taking over the entire wall of the room. This room is an excellent example of the balance between the stately and artistic qualities that these designers have been able to create. In a balanced arrangement that has a certain mirror-image effect, this living room portrays a sense of refinement and luxury. The elongated couch could comfortably fit 4 or 5, taking advantage of the long living room space. All lines point toward the hearth in this design, with many parallel lines in the painting, tables, rug, and furniture indicating the central focus of the room. Even the bathroom is spacious, with a similar sense of expansion found throughout the rest of the home. The tub placed at the far end of the room emphasizes the long, open hallway-shaped space found in this bathroom, with smooth wooden cabinets quietly hiding clutter behind their solid doors. What's your take on this sophisticated home? Comment below!